A light, summer-weight Scotch blend aged in Wine casks from the market leader. While most Johnnie Walker Whiskies are complex blends from several distilleries — sometimes dozens of them — Johnnie Walker Blenders' Batch Wine Cask Blend is sourced from just two. Single Malt is acquired from Cameronbridge and Clyenlish distilleries representing the bottom and top of the Highlands. Expert blender Aimee Gibson has assembled select barrels from these two distilleries that have been aged in a variety of Wine casks to deliver a new, lighter spirit to Johnnie Walker’s extensive and well-earned fan base. We think it’s good pairing with brie, almonds, and melon. 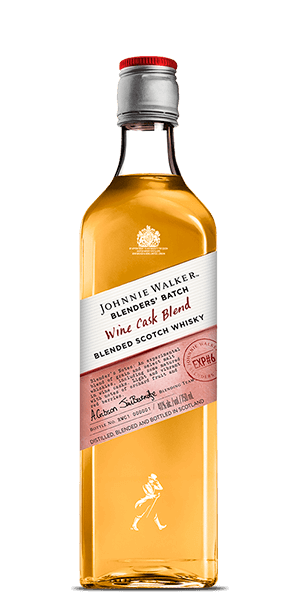 What does Johnnie Walker Blenders' Batch Wine Cask Blend taste like? The Flavor Spiral™ shows the most common flavors that you'll taste in Johnnie Walker Blenders' Batch Wine Cask Blend and gives you a chance to have a taste of it before actually tasting it. Very unique for a Johnnie Walker, the nose opens up with peaches, pineapple, tobacco, and vanilla creams. Along with a dash of peat, you will note bright flavors of butter croissant, apricot, and vanilla creams. The finish is clean and malty with tart fruits and pipe tobacco. Too harsh straight, needs a little more age. Overall the flavor profile was good, but ruined due to young age which stands out. For the price I guess you cant complain. Decent, not bad. There's better out there. This is a very drinkable scotch and at the price point well worth the money, just don't expect to be wowed. A solid offering from Johnnie Walker. Just a light hint of wine cask finishing unlike say a Glenmorangie Lasanta or a Glenfiddich Solera Reserve.